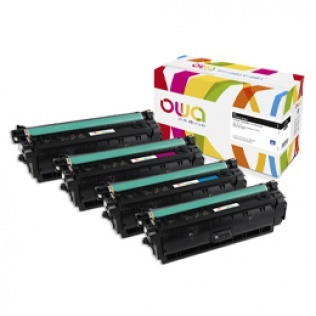 Our laser cartridges are 100% remanufactured and guarantee a lower cost per page, the same print quality as with original consumables, as well as a smaller ecological footprint! Thanks to its production capacity, ARMOR is in position to meet growing market demand. Quality and environmental eco-labels: ARMOR proves its commitment ! Deeply committed to sustainable development, OWA is now the only brand that can boast three different eco-labels : Nordic Ecolabel, NF Environnement and Blue Angel. A German eco-label indicating that toxic waste emissions per item are controlled and limits are strictly complied with. Blue Angel certification therefore ensures a reduction in waste products and conservation of natural resources, as well as stricter compliance with health and safety standards at work. Voluntary certification issued by AFNOR which entails limiting the product’s impact on the environment throughout its life cycle. The product must also comply with environmental and usability criteria. Using “NF Environnement” products contributes to environmentally responsible consumer behaviour. Laser cartridges bearing this eco-label generate less waste and consume less energy and fewer raw materials. The eco-label also focuses on product quality through recycling process quality assurance, labelling, and customer information.